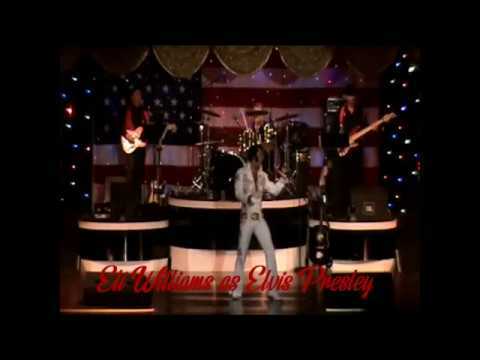 Multiple award winning ETA, Eli Williams and star of ELVIS & FRIENDS (2017-2018) at Memories Theatre in Pigeon Forge, Tennessee. Eli pours his heart and soul into every single performance. Over a young career, he has performed across the world amassing many champions as well as producing amazing shows with his band, Tupelo Lightning. A fresh, real, cool, rock and roll inspired tribute to the King of Rock & Roll, reminding us why Elvis was and is the King. From raw Rockabilly of the 1950s, to the huge, lavish, Vegas productions of the 1970s, Eli Williams does it all. A dynamic, fresh, authentic tribute show, not to be missed. Eli is available for events of any size WORLD-WIDE!!! I hired Eli to appear at my Mom's 90th Birthday Party that was held at my house, and it was just a small gathering for the family. The plan was to surprise her, sing a few songs, end with Happy Birthday and take some photos afterwards. Eli went above and beyond to give my mom a great performance. He sang a lot more songs then we expected, which was awesome! Everyone enjoyed it so much. He is very personable, has a fantastic voice, and stays in character in between songs. He even sang Hound Dog to my daughters English Bulldog haha! 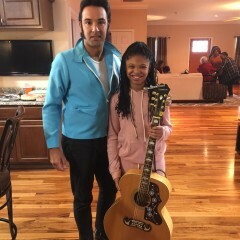 Elvis really did come to our house, my Mom can't stop talking about it! I would hire him again for another event in a heartbeat. Well worth it! Thank you, Eli!!! Thank you so much Arlene -- it was a lot of fun and it was an honor to be part of your Mom's 90th ! I very much hope to see you again ! Your compliments are so beyond appreciated! On time. Did excellent performance. Well worth it. Elders enjoyed his singing at our Christmas party. It was a privilege a d a pleasure to be part of the elders Christmas lunch. Merry Christmas! Eli was so great, he had the ladies charmed as he serenaded them throughout the night. He got everyone up and dancing and having a fantastic time. We could not have asked for more! Thank you so much Paige !!! It was so much fun and I'm glad that everyone had fun! Very much hope to see you Again! Merry Christmas! Wasn't dressed as Elvis as expected but did a good job of officiating our wedding. Thanks!! 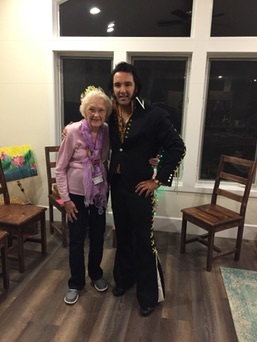 Eli spent a great deal of time interacting with the residents and staff of our Assisted Living Facility. He was very professional and entertaining. Everyone is asking when can he come back again. Thank you so much Barbara -- it was an absolute please ti work for you and I very much hope to do so again! Booking Eli was such a great decision! He was prompt (even after driving over an hour), courteous, friendly, charismatic, and generous to our guests. His singing voice is fantastic, so I would definitely encourage anyone to book him for performances. All in all, I'm thrilled we got to enjoy his presence for our event. Thanks again! Thank you so much Jennifer.. it was an immense pleasure performing for you and all the volunteers. I very much hope to work with you again! Our group LOVED Eli as ELVIS! He is an incredible singer, sounds just like Elvis, and hit every note perfectly. He was very accommodating to our needs and put on a great show. 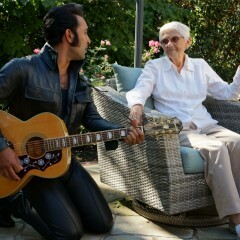 Our ladies loved that he pulled off Elvis's early years look, and he treated our senior ladies with grace. 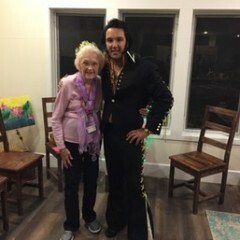 One of our men had seen Elvis live during his years in the service and commented that Eli did an outstanding job as Elvis... we can't wait to have him back! Thank you so much Michele!! It was a lot of fun!! I am glad everyone enjoyed it, and I very much look forward to seeing you again! Eli did a wonderful job at our family Christmas Dinner. Thank you so much for the review, it was an absolute pleasure! 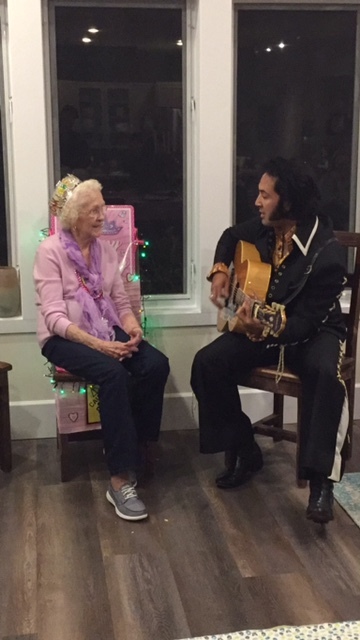 Eli was super flexible and accommodating for last minute arrangements to surprise my friend with a sweet serenade for her birthday! Thank you so much Allen -- I truly appreciate it. It was an absolute pleasure to spend some of thanksgiving day woth your wonderful family. And I am so happy that your niece had a memorable birthday! The icing on the cake for our party! We are so glad we hired Eli. He looked and sounded like the real deal. He knew how to work the crowd, and had everyone smiling and laughing the whole time. 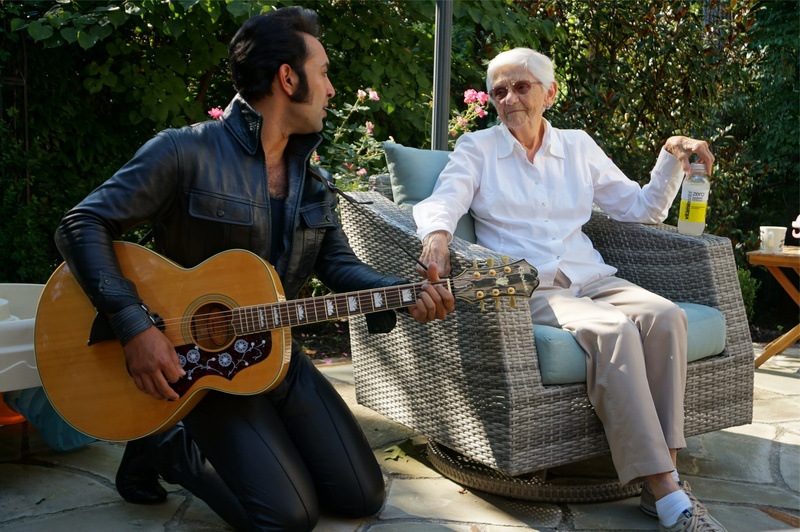 Even my grandmother, who loves Elvis but said many times that she didn't want any surprise guests, started tapping her toes and singing along. I would highly recommend him to anyone! Excellent ! Highly recommend ! Exceeded my expectations. From the minute he entered the party he captured the attention of the crowd. His interactions with us were playful and fun. We are going to see him in Pigeon Forge. He made this party a memory for all. Eli is the perfect ELVIS! We couldn't be more pleased. 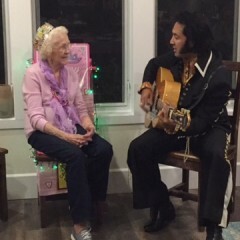 He made my mom's 90th birthday her best ever! Thank you very much Claudia and family... I had a great time and am glad that your mom had a great birthday. I very much hope to see you again! It wasn't a bad performance. Just wasn't a memorable performance. Eli is an awesome entertainer. He was exactly what I was looking for when it came to representing the King of Rock and Roll. Our elderly assisted living residents gave him huge applause during 1960s celebration and eas still talking about how nice he was the next day. 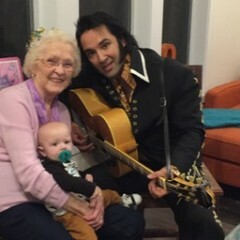 So, if you are looking for an excellent show from a impersonator that represents the younger clean cut Elvis, Eli is your man!!! Professional. Worked the crowd. Great performance-thanks for Blue Christmas. I recommend. Eli did such a great job! Everyone was happy with his performance and his impersonation of Elvis. 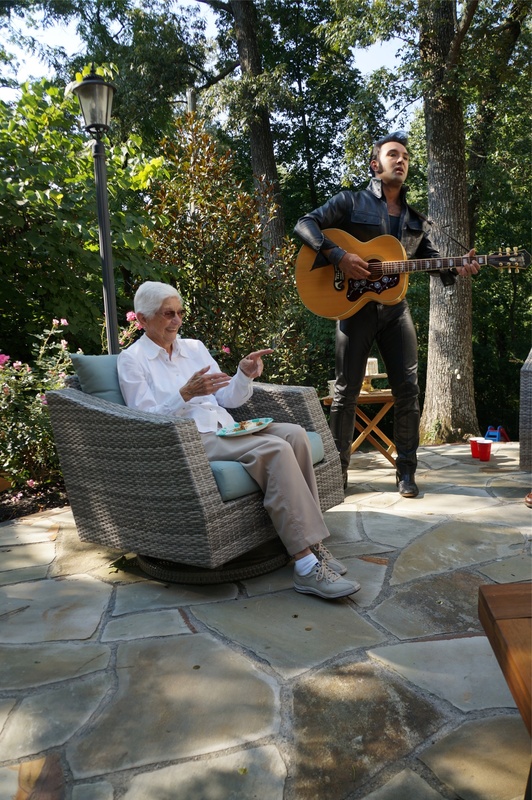 He really brought Elvis to our party. 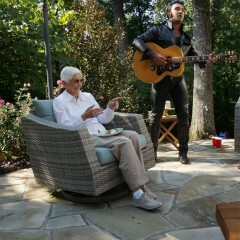 My grandfather said he was the best Elvis he's seen! He was very nice and put on a great show. It will be a birthday party no one will forget. A lot of people were wanting to book him for their event also. I highly recommend Eli for the job! Excellent entertainer, sounds like Elvis and has all his moves down pat. As well, Eli is very engaging with members of the audience. We were so happy with his performance we booked him on the spot for another engagement . I would highly recommend Eli ! From small intimate settings to large show rooms, Eli can do it all. 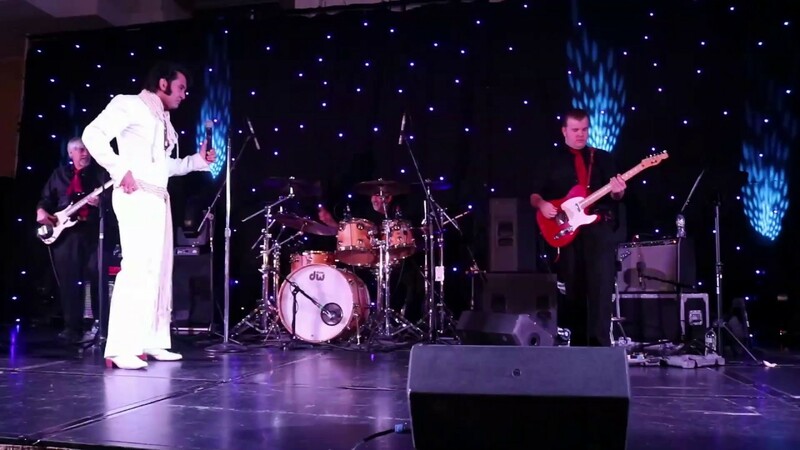 Make your event memorable and bring Eli's authentic tribute to the King of Rock and Roll, Elvis Presley! We knew Eli's performance with with the Hang-Ten Hangmen at our USO tribute event was going to be good. We didn't know it was going to be THAT good, and that he would nail the Army-era Elvis persona so perfectly, right down to the uniform. Eli's got the look, the voice and the moves! He's also an engaging performer who interacts with his audience members, sings to them and with them, and he even came to the edge of the stage to ham it up in selfies with our excited guests. The venue was a large hotel ballroom with a big stage and about 500 guests. From the moment he made his entrance, Eli commanded the entire room, and I can hardly describe how much fun everyone had at the show. I hope we have the opportunity to bring him back for future events. I cannot recommend Eli's talent and professionalism more highly. "Eli showed up hours before the party to set up his sound system and speakers and then showed up at the exact appointed time dressed in his white jumpsuit! Eli’s own sideburns really add to the authentic Elvis look. Eli’s voice was a perfect match for Elvis’s voice and Eli had some of the women swooning! Eli’s performance, choice of songs and sense of humour were a hit at our party. He had the crowd laughing and I’ll never forget when he started singing “Suspicious Minds” how everyone started singing along with him. Several of our guests asked for his card and number after the event. 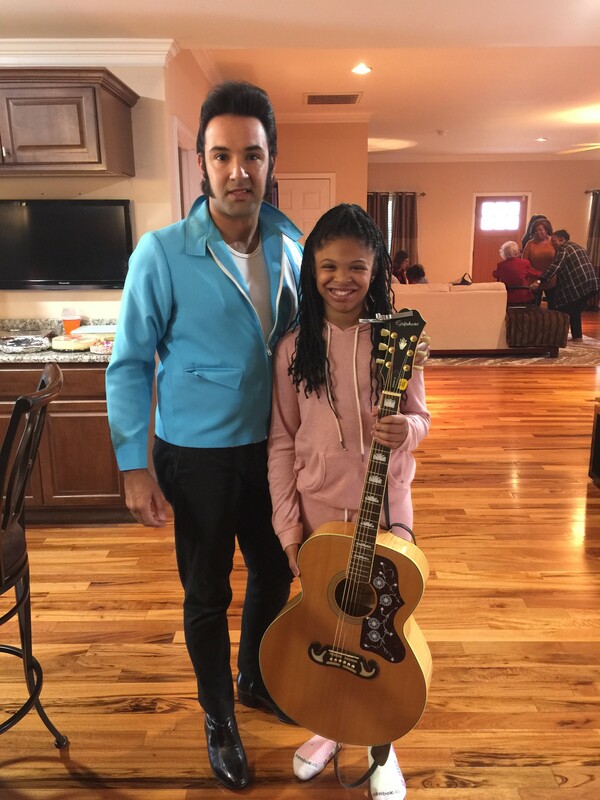 Eli’s performance kicked our party up an extra notch and the day after the party, several friends called us to thank us for a great party and told us that Elvis was a big part of their fun. I would highly recommend hiring Eli for your next event." "We have an annual event for Elvis’s birthday. Eli has been our go-to Elvis for years. He has quite the following and as it starts getting close to January the seniors start asking me about Elvis and they only want to hear that Eli will be coming back again this year. He is extremely professional and comes in Elvis’s signature jumpsuit and one has to take a second take as hear looks just like Elvis. As far as I am concerned, there is only 1 Elvis in the Vancouver area and his name is Eli Williams." " I'm sure with eyes closed you would swear "The King" himself was there! The outfit, the hair, the voice....all amazing. There were around 20 ladies in attendance and Eli (Elvis) did not dissapoint. I know the guys would have enjoyed it just as much as we did. And to add to the fun, Elvis had a fantastic sense of humor. Everyone had smiles on their faces. This will be talked about for years to come! Will definitely be booking again!" 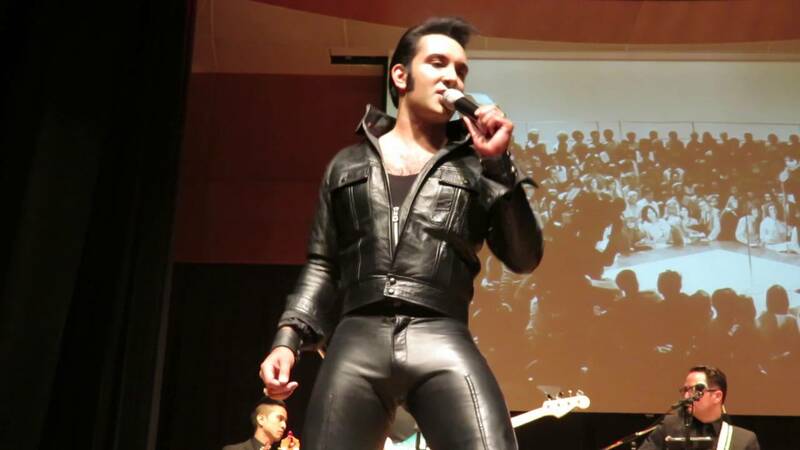 Eli Williams has gone from being an Elvis fan to being an award winning Tribute Artist. 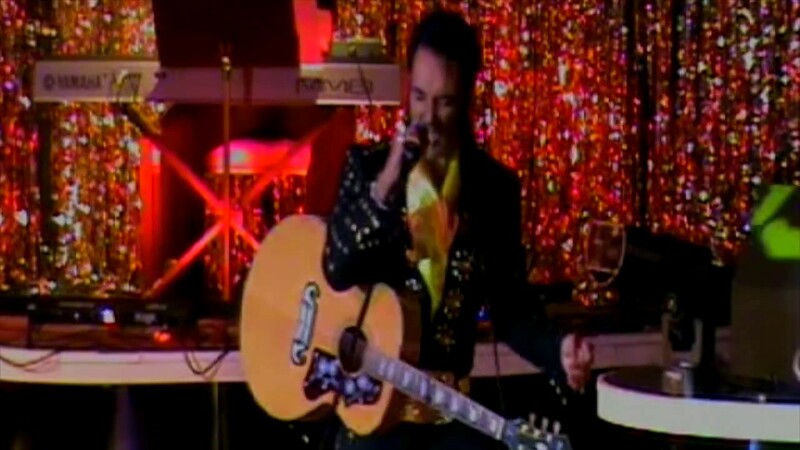 His dynamic tribute highlights Elvis Presley's triumphant, landmark performace in his Singer TV Special, or, as it has become known, the 68 Comeback. 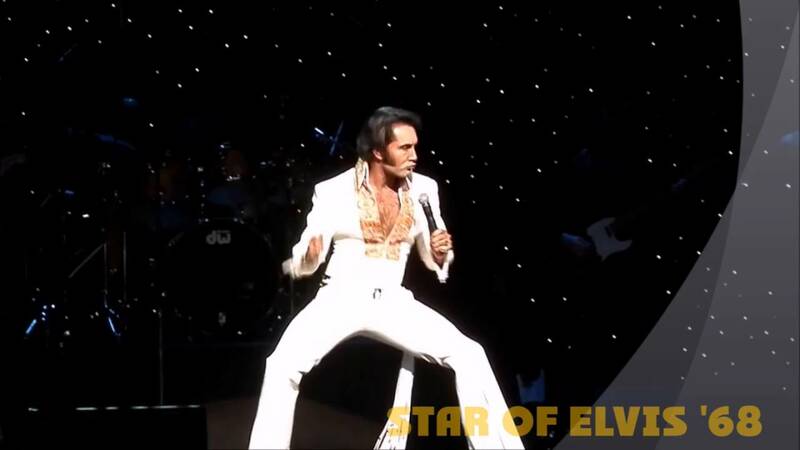 Eli goes on further from the Special to pay tribute to Elvis' 1969 Return to the bright lights of Las Vegas and his astounding documentary Elvis: Thats the Way it is. Eli has been an Elvis fan since he was a small child and was exposed to original vinyl albums. As time progressed, he became hooked by the dynamic music and unparalleled style of Elvis Presley. His dreams quickly became to show this admiration for the King of Rock 'n' Roll through paying an honest, heartfelt, and meaningful tribute to him. 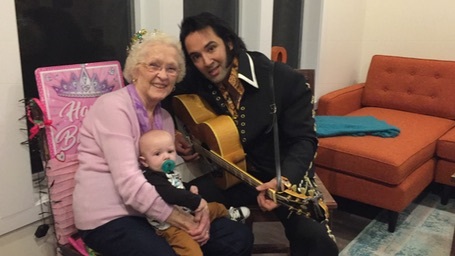 Eli currently is the headline performer at the ELVIS & FRIENDS show at Memories Theater in Pigeon Forge Tennessee,one of the original Legends show in America, the only one in Tennessee and the same theater where Elvis' close personal friend Charlie Hodge performed. Recent review: Johnny Reno did a great job for us!